After loving our apple sight word mazes last week, I decided I needed to make pumpkin mazes next. These are so easy to use. I used glittery bingo markers this time to color the sight words, but you can use crayons or laminate and use plastic pieces to cover the words. This is perfect practice for fall or Halloween. 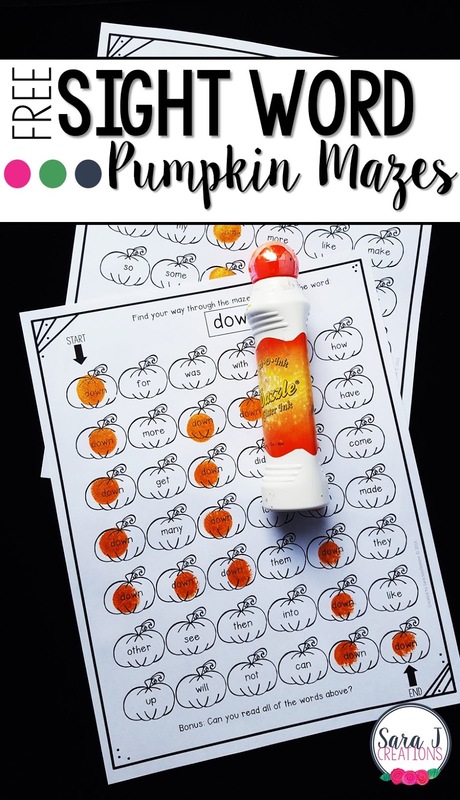 To use these mazes, have students start at the arrow and color that first pumpkin. Then they will need to search for a pumpkin that is next to that one that has the same focus sight word for that page. They will work their way through the page coloring that focus sight word only. The next pumpkin they need to color could be above, below, to the right or to the left. Once they've made it to the word "end" they are finished. Now, they can try the bonus of reading all the sight words on the page. This set of sight word practice pages focuses on the words: they, come, down, more, when. If you are looking for other sight word practice try our apple version of these mazes or try our MEGA bundle of sight word activities. To grab your free mazes, click the button below, enter your email and they will be emailed automatically to you. Do you need more sight words than just the ones included in this freebie? Try these EDITABLE pumpkin mazes. You type in the words you want and the mazes will be automatically created for you. Super easy! !